Prepare shrimp. Mix together all ingredients and marinate the shrimp, 1-4 hours. Spread shrimp on a baking sheet, season with salt and pepper and roast 3-4minutes on each side. Shrimp should be pink. 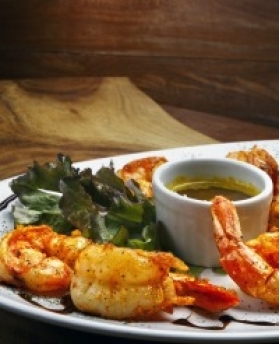 Shrimp can be served at room temperature or warm. Delicious with the following aioli recipes.